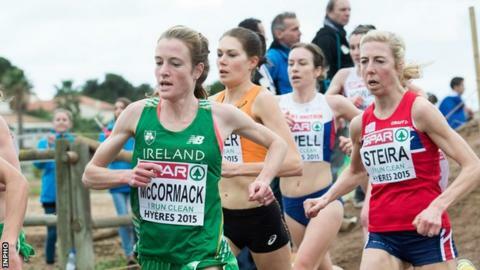 Ireland's women won a second straight team bronze at the European Cross Country Championships with Fionnuala McCormack fourth in the race. Twice champion McCormack was 13 seconds behind Dutch winner Sifan Hassan in Sunday's race at Hyeres in France. Lizzie Lee's 13th and international debutant Caroline Crowley's 23rd spot were vital to the Irish team medal. Ciara Durkan was 43rd with Michelle Finn and Newcastle's Kerry O'Flaherty the non-scorers in 54th and 55th. However, Finn and Northern Ireland woman O'Flaherty, 34, still picked up medals as part of the successful Irish team. McCormack, who won the individual title in 2011 and 2012, was outside the top 10 in the first lap but her move into the top six as Spain's early challenger Trihas Gebre faded was crucial to Ireland edging into a medal position in the team event. Gebre had attempted to stay with her fellow Ethiopian-born Hassan over the opening three laps. However, Gebre then started to drop back which left this year's world 1500m bronze medallist Hassan with a big advantage. McCormack just failed to overhaul Norway's bronze medallist Karoline Grovdal. Kate Avery's silver medal helped Britain comfortably retain the team title on 33 points ahead of hosts France (78) with Ireland's 83-point total leaving them 12 ahead of Spain. Dubliner Crowley, 27, only started running three years ago and was a surprise third placer at the recent Irish Championships at Santry. Crowley's achievement comes after a year when both of her parents died suddenly. Paul Pollock had to settle for 45th place in the senior men's race as he finished two minutes and 11 seconds behind Turkey's Kenyan-born Ali Kaya in the 10K event. Mick Clohisey was the leading Irishman in 37th with John Coghlan 47th, Sergiu Ciobanu 52nd, Joe Sweeney 58th and Ryan Creech 65th. Lisburn AC's James Edgar finished 70th in the junior men's race where Jack O'Leary was the leading Irish representative in 23rd ahead of Kevin Mulcaire in 25th. The Eamon Christie-trained Banbridge athlete Emma Mitchell finished 36th in the women's Under-23 event with Irish team-mate Shona Heaslip three seconds ahead of the Ulsterwoman in 33rd.